David and Jan Nygaard with their six special reasons for helping Children's Hospital – from left, Calvin, 5; Lance, 3; identical twin girls, Aby and Aly, 5 months; Eric, 6; and Nathaniel 19 months, in his dad's arms. 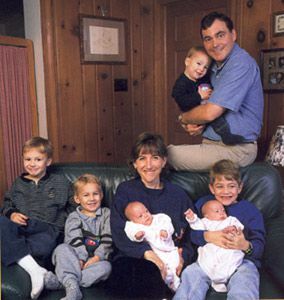 nygaard-family.jpgDavid NygaardDavid and Jan Nygaard of Virginia Beach have six children under the age of six. Three of them, Nathaniel, Aby and Aly, have special health concerns that have required the family to make frequent trips to and from Children's Hospital. The Nygaards own their own business, David Nygaard Fine Jewelers, and, in addition to work and family responsibilities, David is earning an MBA at Regent University. If there were ever a family that could legitimately plead, "Sorry, we're just too busy to help," it would be the Nygaards. But instead, they do just the opposite; they actively seek ways they can support organizations they believe in, such as Children's Hospital. Time isn't even an issue, says David Nygaard, because philanthropy means much more to him than an item on a "to-do" list. Philanthropy is an integral part of his mission in life, a thread woven into the fabric of everything he does. Last year, the Nygaards developed a fund-raising project for CHKD that shows how beautifully he is able to integrate his work talents, family concerns and philanthropic goals to the benefit of all. To honor their son Nathaniel, who is treated at Children's Hospital for a heart condition, the Nygaards created a diamond pendent in the shape of a heart. Then they donated a portion of the proceeds of every pendant they sold to CHKD. In the end, they raised enough money to purchase a new EKG machine for the cardiology clinic. It was a simple idea, born from one family's desire to express gratitude and give help. But it touched the hearts of so many others – not only those who received the pendant as a gift from a loved one, but also thousands of area children whose hearts, like Nathaniel Nygaard's, need the tender, loving care of Children's Hospital of the Kings Daughters.